Let's admit, there are many children clothing brands in Singapore that we are spoil for choice BUT almost 90% of their clothing are for girls. Bummer for the boys or Mums of boys, like me. Boys only need a top and bottom, nothing as fanciful as the girls BUT (again) the price tag that comes with these shirt/tees/pants/shorts does not come cheap OR not justifiable. Since he was a toddler DinoBoy has been choosing his own clothes, this is because he was a spirited child who is also very sensitive to the texture of clothes. 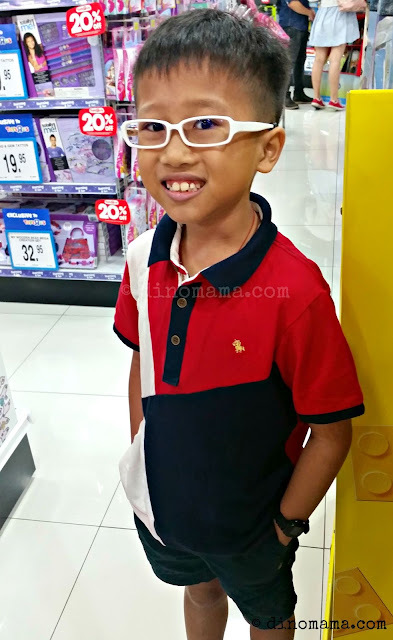 If the material feels scratchy against his skin even if its a tiny bit he will immediately reject, it was difficult buying clothes for him initially but things got easy once we managed to find a couple of stores. 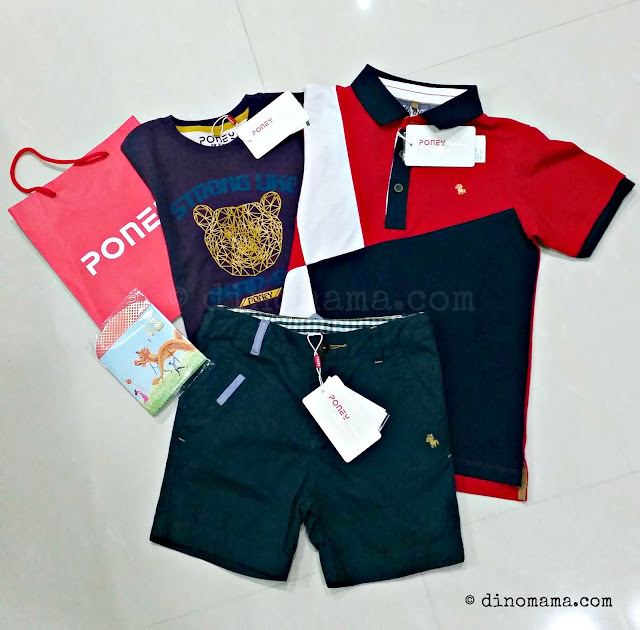 Earlier this year, DinoBoy "approved" PONEY; a reputable children clothing brand, when we were out shopping for Chinese New Year clothes in Seletar Mall. While trying out their clothes, DinoBoy gave 2 thumbs up and a huge grin on his face the moment he came out from the fitting room. That was the fastest shopping we did that day! I guess the soft, comfortable material won him over and DinoBoy especially likes the dark green shorts. I love their stylish clothes in vibrant colors and that there are more selections of clothes for the boys too. You should take a look at their clothes for the girls, they are so pretty and adorable! My boy looks so stylish and handsome right? PONEY Group is a leading retailer in Malaysia, specializing in a wide range of comfortable and fashionable products for kids. It houses three well-known brands: PONEY, BABY PONEY and PONEY ENFANTS. These brands offer high quality apparels and accessories for newborns, toddlers and kids up to 12 years old. Founded in 1992 by Mr. Albert Tan and wife, Mdm. Sharon Ng, PONEY Group has grown by leaps and bounds. You people knows that we will ONLY recommend stuffs that we love, value for money and of good quality, well, PONEY fits all our minimum criteria so we strongly suggest that you should visit their boutique to look at their clothes. How about a SGD50 PONEY voucher to start off your first wonderful shopping experience with PONEY? Disclaimer : We approached PONEY Singapore for our SG50 August Giveaway and they were generous to to sponsor x2 SGD50 shopping vouchers, no other forms of compensation were received. All opinions are 100% ours and all photos in this post unless otherwise credited, are copyrighted and belongs to the DinoFamily, you may not use any of the photos for any purposes without seeking our approval. Answer: PONEY SG50 PROMOTION is running till end August. Just need to spend $50 in a single receipt instead of the usual $80 to entitle for lifetime membership. 50% off referral reward. (Refer a friend to be a PONEY member and enjoy 1 time 50% off purchase entitlement valid 24 july to 30 aug 2015. During this period, we can sign up to be a lifetime PONEY member just by spending $50, instead of the usual $80, in a single receipt! Answer: You only need to spend $50 in a single receipt, instead of the usual $80, to get lifetime membership. Lifetime membership when you spend $50 in a single receipt. Lifetime membership when you spend $50 (usual $80) in a single receipt before 30 August 2015. If you refer a friend to be a PONEY member you get to enjoy a one-time 50% discount on your next PONEY purchase. lifetime membership when you spend $50 in a single receipt! 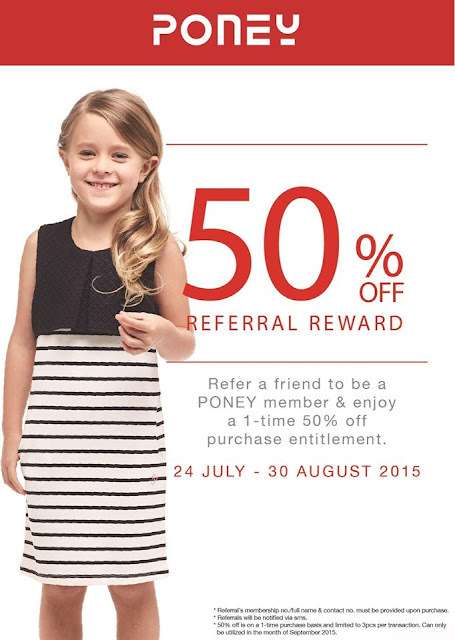 24 Jul 2015 to 30 Aug 2015 - Refer a friend to be a PONEY member and and enjoy a 1-time 50% off purchase entitlement. Lifetime membership when u spend $50 in a single receipt. From 20th July to 30th Aug, simply spend $50 instead of the usual $80 at Poney stores located at Seletar Mall or Marina Bay Sands to qualify for a lifetime membership. 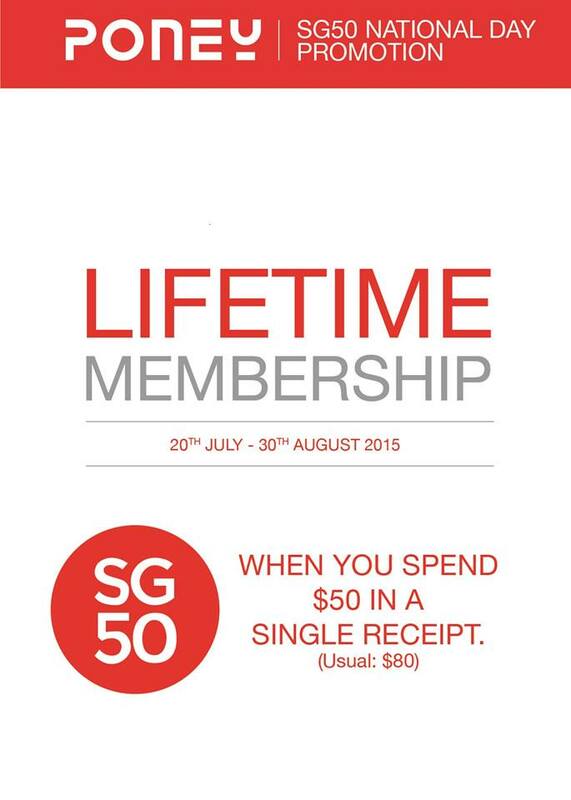 Lifetime membership if spend $50 for the SG50 Promotion. SG50 Poney promotion is to spend $50 in a single receipt to qualify for a Poney Lifetime Membership.